Description: Inviting elegance meets industrial design. A White paper shade tops an industrial styled support attached to a Crystal Idalight mirror backplate finished in Blackened Pewter. 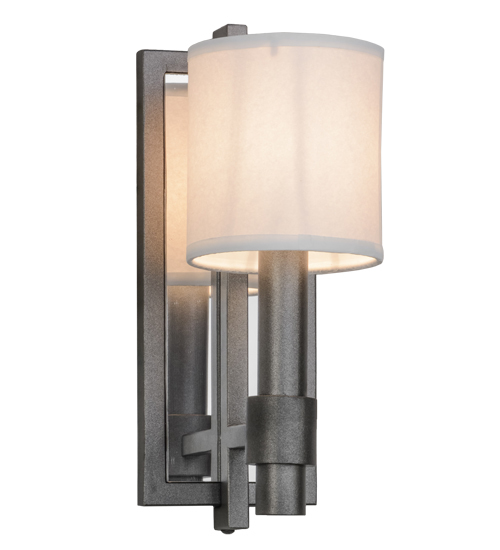 Perfect for corridors and entryways in residential, hospitality and commercial interiors. The fixture is handcrafted by master artisans in our 180,000 square foot manufacturing facility in Yorkville, New York. Custom designs, styles, sizes and dimmable energy efficient lamping options are available. UL and cUL listed for damp and dry locations.